Funny because it's true. 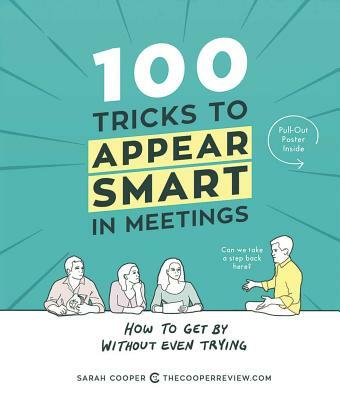 From the creator of the viral sensation "10 Tricks to Appear Smart in Meetings" (5+ million views and hundreds of thousands of shares) comes the must-have book you never knew you needed, 100 Tricks to Appear Smart in Meetings. In it, you will learn how to appear smart in less than half the time it takes to actually learn anything. You know those subtle tricks your coworkers are all guilty of? The constant nodding, pretend concentration, useless rhetorical questions? These tricks make them seem like they know what they’re doing when in fact they have no clue. This behavior is so ingrained, so subtle, and so often mistaken for true intelligence that identifying it, calling it out, or compiling it into an exhaustive digest has never been attempted. Until now. Complete with illustrated tips, examples, and scenarios, 100 Tricks gives you actionable ways to use words like “actionable,” in order to sound smart. Every type of meeting is covered, from general meetings where you stopped paying attention almost immediately, to one-on-one meetings you zoned out on, to impromptu meetings you were painfully subjected to at the last minute. It’s all here. If you hadn’t noticed these behaviors before, you will see them now—from your colleagues, your managers, and soon yourself. Each trick is a mirror to the reality of what happens in meetings, told in the form of hilariously bad advice—advice that you might just want to take. But probably not. But maybe. Sarah Cooper is a blogger, vlogger, and comedian whose satirical blog TheCooperReview.com pokes fun at corporate culture, the tech world, and everything in between. After 15 years working for companies like Google and Yahoo!, she knows her subject well. Her “10 Tricks to Appear Smart in Meetings” post has circled the globe, with 5 million views and counting. Her work has appeared on The Washington Post, Fast Company, Business Insider, Huffington Post, and countless more. Sarah lives with her husband in San Francisco and enjoys 90s rock, standup comedy, and both sunny and cloudy days equally.